During a seemingly random, cooler-than-usual late Thursday afternoon, The Mayan Theater—once a historic movie palace from the glory days of Hollywood, but now a night club with a Mayan ruins theme—hosted a special event. The Shadow of the Tomb Raider was finally being officially revealed, and revealed in a venue that felt tailor-made for the spelunking action full of mystery and intrigue that Lara Croft and crew seem to do so well these days. We managed to get our hands on the upcoming game, and have our Shadow of the Tomb Raider preview available now. While Shadow of the Tomb Raider is releasing on the PlayStation 4, Xbox One, and Windows platforms simultaneously this time around, the game was running on Xbox One units (presumably, Xbox One X consoles, but this was not confirmed). Everything ran smoothly, and although the mission we played took place in the evening, details were crisp and character models were believable. What good is a globetrotting adventure if there are no puzzles? Though the demo offered was only about an hour long, Lara was busy using her bow and arrow as a sort of glorified Swiss army knife. It could, for instance, be used as a pulley to move certain objects. It could also be used as an impromptu zipline in some areas. It’s obviously going to be a key item in Lara’s ever-evolving arsenal. Platforming was also evident for some of these sections, including a new ability to rappel off of certain materials, which will introduce more verticality to level design. Combat appears to be largely the same as in Rise of the Tomb Raider. Lara has an assortment of weapons including the aforementioned bow and arrows, as well as a pistol, rifle, and her now iconic pickaxes. Stealth options are believably available – while someone rounding a corner Lara is hidden on the other side of will be blissfully unaware of her until it is too late, others who hear the commotion or see the resulting dead body left out in the open will up their guard level and be much more alert to Lara’s presence. While Lara may have been able to swim in previous games, it was never for a lengthy period of time. 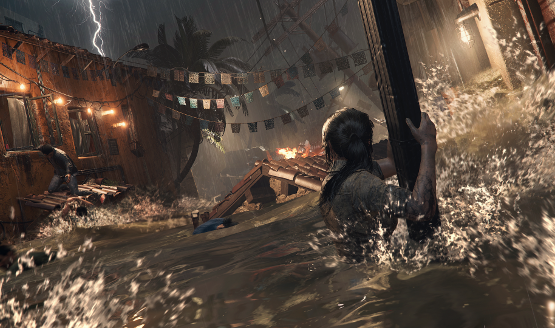 In Shadow of the Tomb Raider, Lara is now able to swim for as long as she can hold her breath. The mission we played gave a glimpse of some of this mechanic, as she had to swim through some tight underwater corridors amidst partially-submerged ruins. At various lengths of time underwater, columns of air bubbles could be seen rising to the top of a small exposed pocket of air. Swimming up to the column enabled Lara to swim to the pocket, take a deep breath, and get back in the water, lungs freshly refilled. It did feel a bit disorienting as the camera swung around to show Lara’s face as she inhaled, then pivoted again behind her – it would be all too easy to be turned around by this short animation, and end up swimming back the way Lara came from, but it’s probably just something that players need to get used to. Swimming also felt wonderfully claustrophobic, as it usually does in real life. 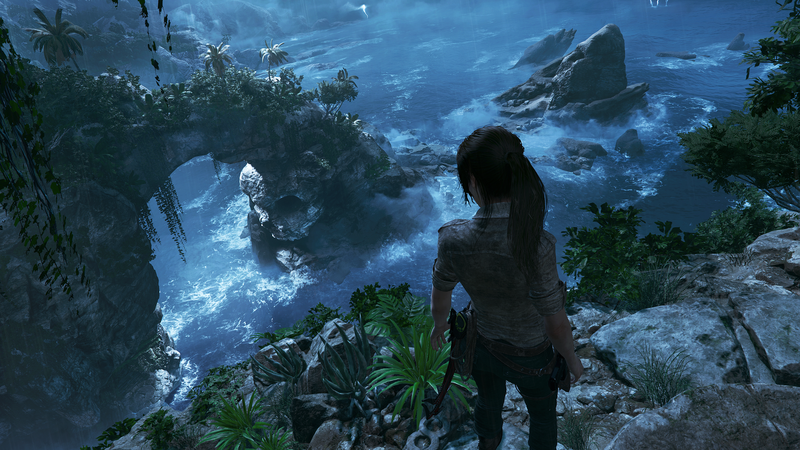 The ruins Lara found herself in were full of undersea life, including starting creatures that could definitely induce a jump scare or two. Combine that with the usual unstableness that comes with exploring ancient ruins, and the fact that exploration underwater will reportedly result in finding hidden tombs, and the massive risk of the possibility of drowning will now have to be weighed against the potential rewards of what lurks beneath the surface. The Tomb Raider series has been known for some gripping storytelling, and this seems to continue with Shadow of the Tomb Raider. Lara Croft is after a new ancient artifact, of Mayan lineage this time. She finds herself fighting the Trinity paramilitary corporation (PMC) again, in a race to obtain the relic first. To her own surprise, Lara sets off a series of cataclysmic events and pretty soon she is not only up against a PMC, but perhaps the end of the world. Voice acting felt strong in the demo that we played, and one scene involves an unexpected death that can have a huge emotional impact on players depending on if they’re a real-life parent or not. It seems this story will be one gamers won’t want to put down for very long, if it can keep up the intensity. Shadow of the Tomb Raider appears to have the right stuff to show us all how Lara Croft became the fearless woman we were first introduced to nearly 22 years ago. Tight combat mixed with intriguing puzzles and an entertaining story should hold up to finish off this prequel trilogy, and fans are no doubt waiting with bated breath for “the end of the beginning” promised in the initial trailer. Shadow of the Tomb Raider is currently slated to launch on September 14, 2018 on the PlayStation 4, Xbox One, and Windows platforms.